I am not really sure of the name of the fish as I have found it in a dictionary as dusky grouper.In Greek there is only one name for it: Rofos and then looking it out in the internet I saw that there are a few types of groupers: Red Grouper, Dusky grouper, Golden grouper etc., so can I guess from its colour this is a red grouper? If you know the correct name please let me know. However, for this recipe, you can use any kind of grouper or other big fish you like such as a gilt head, a red snapper, a sea bass, a trout or a salmon. Don’t be afraid to use the salt as the fish will not get salty.If you like you don’t have to scale the fish as the scales gets discarded together with the skin. I saw this recipe more than a year ago, before I began blogging at Elias Mamalakis’ T.V. show and I could not remember exactly what ingredients he used but I found the recipe on his site.As I often say, I cannot stick to recipes and whilst he made it with sea bass and filled the fish with mushrooms, garlic, parsley and peppercorns, I chose to add lemon slices as well and added my favourite spice cardamom. Since I found this spice I have been addicted to it and could not resist adding it as well. Mamalakis used only salt to cover the fish but as I had only one packet of salt and discovered half way that it was not enough to cover the fish, I added two egg whites and some flour and remaining salt and made a salt batter to cover it.Instead of pouring butter on the vegetables as he did, I made a ladolemono sauce with oregano. Scale, gut and wash the fish. (Scaling is not necessary as the scales will stick on the crust and the skin and will be discarded). In a bowl put the salt, flour and egg whites and mix with a spoon. Addwater gradually until you have a very thick batter. (You may not need all the water). Wipe the mushroom and cut it into slices, as well as the lemon, parsley and garlic. Mix in the cardamom pods and the peppercorns and stuff the fish. Place a small piece of aluminum foil around the opening to secure, or secure with a toothpick. Layer the tin with some of the salt mixture and place the grouper on top. Cover with the remaining salt mixture. Preheat the oven to 180ο C / 350ο F and bake for 1 hour. Remove from the oven and leave it for a few minutes to cool down and then break the crust with a small hammer and remove crust as well as skin. Serve in a platter with the steamed vegetables and serve with the ladolemono dressing. I too have seen fish cooked like this before but never tried it. Your dish is encouraging me to do so. Thanks Cynthia and Val. It’s easy and healthy and I am sure your will both love it. Hi Jenn and thanks for letting me know about the name. Hi Swati, nice to have you back again. You always make delicious Mediterranean cuisine. The fish is ugly and a little scary though. T & D, if you look closer you will notice that I inserted a toothpick in its mouth to keep it open. I am sure it's say "Let me go" (lol). I think that’s a red grouper, but I’m no expert on the matter. I’ve wanted to try fish prepared in this style for a long time–I just keep forgetting to. I hope I can find some good looking fish this weekend, because if I can, I absolutely have to try it–this looks awesome! Wow Ivy, you have outdone yourself! 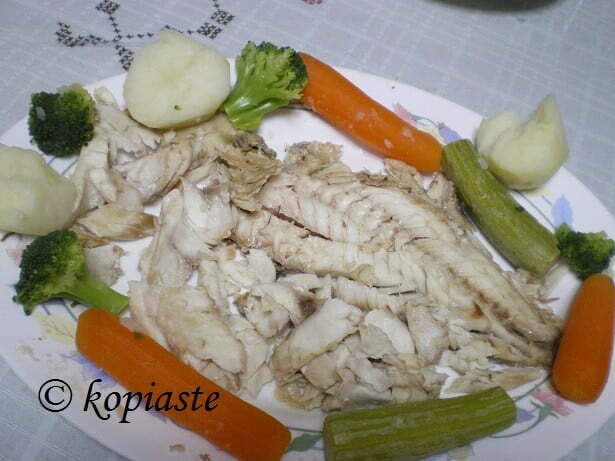 I bet fish prepared this way can cause addiction, and what a healthy one would that be. Love it but I am also intrigued by the cardamom pods. Thanks lore. Since I started using cardamom, I’m addicted and that’s my twist to the recipe which gives this great aroma. This looks delicious! I’ve always wanted to try salt crust cooking. About the fish, I looked it up in Alan Davidson’s “Mediterranean Seafood,” which is an excellent book I got when I saw Laurie recommending it. There are two species of grouper for which Davidson gives “rofos” as the Greek name. One is the Dusky Grouper, which is reddish or yellowish brown. He says that over 50% of the groupers in the Mediterranean are of this species. The other species of grouper he calls “rofos” is the Dogtooth Grouper, which is a dark gray and only comprises about 10% of the Mediterranean grouper population.